You can look at data in a hundred different ways. 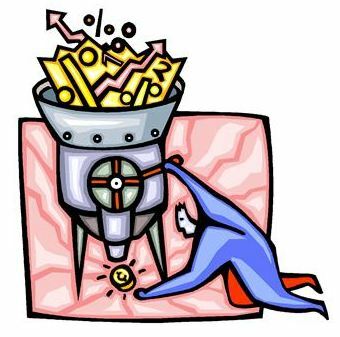 Traditionally, marketers will look at AdWords data and focus on volume or CPC metrics as selection criteria. Looking for opportunity in the long tail is another way to sort through a mountain of keyword phrases. Whatever technique you use to select keywords can be augmented by using industry standard BI techniques. This allows you identify search themes that are not apparent at first glance. This process allows you to apply a statistical approach to developing original content. To make this work you have to look at each query and classify it to a category of behavior. What is the query about? What problem was the searcher trying to solve when they typed in that keyword phrase? As an example, I classified over 800 keyword phrases used by consumers to search for a Family Restaurant. Overall there are just 25 categories of behavior associated with a consumer’s search for a family restaurant. Further, you can see that there are under ten broad themes in this data. Searching for a Type of restaurant, or specifying an important Quality about the restaurant are two good examples in the following table. One important theme is Quality vs.Value. Hands down, consumers are much more interested in Quality. There are over 1.6 million search queries associated with Quality, and 158K with Value. Statistically the word Best is the most important search term in the consumer’s search vocabulary. A second theme is the consumer’s search for specifically named content. You can see that they are interested in Menus and Guides, however there is nearly a six fold increase in interest for Menus over Guides. Being included in a restaurant guide is strategically important, but providing easy access to a menu is much more important. 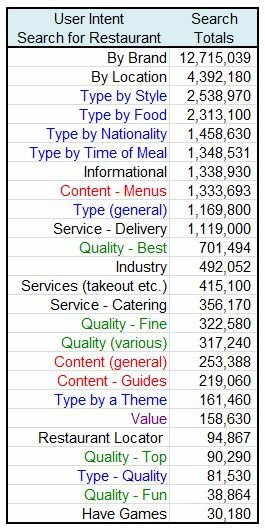 Other themes can be identified in this table, such as the search for a Service and for a Type of restaurant or a Type of food. Consumers search for a type of product or service in very large numbers across all industries. It very useful to understand how they do so in your market. This type of analysis provides you with additional options for creating new content and focusing ad copy. It also allows you to experiment with custom landing pages that target a category of behavior. The great thing about this technique is that it augments what you already do with your existing keyword strategy.